Lens adapters can be useful things sometimes, letting you mount one brand of lens on another brand of camera. One thing that has always bothered me, though, is the idea of doubling the number of lens-mount interfaces. When you look at the thick metal pieces on the front of the camera and the back of the lens, and then consider that they have to be lined up exactly parallel to the image sensor, it’s kind of amazing it works. Although it doesn’t always work. Lloyd Chambers first reported years ago that with high-quality, wide-angle lenses you could detect very small misalignments in the camera-lens mount. Misalignment of 10 microns from side-to-side was enough to cause blur on the sides of the image. Since then a lot of other people have confirmed the same thing. So when I hear people cavalierly talking about putting an adapter on their camera I tend to cringe. When a single camera-lens interface has enough variability to sometimes be visible, adding another large piece of metal with another mount interface seems a recipe for problems. Don’t get me wrong. Generally, they’re acceptable or people wouldn’t use them. But I always am curious about what acceptable looks like in the lab. We’ve been working a lot with our optical bench, testing large enough quantities of each lens to develop our acceptable ranges, since we plan to start adding this testing to the Imatest testing we currently use for quality assurance. An optical bench isn’t necessarily better than image-based testing programs like Imatest, but it has some specific advantages. One big difference is that an optical bench tests at infinity (on wide-angle lenses, Imatest or DxOAnalytics may be testing at 4-6 feet focusing distance). Another is it tests the lens directly; the variability of a camera body is eliminated from the loop. There are some things a bench doesn’t do as well, too. For example you don’t get a full picture of the entire lens in one run; you get a line of data from one side to the other. You have to rotate the lens in its mount and do several lines to get a complete picture of the entire lens surface. Since the information from our optical bench is different from the Imatest graphs I usually use for illustrations, let me go over one quickly. 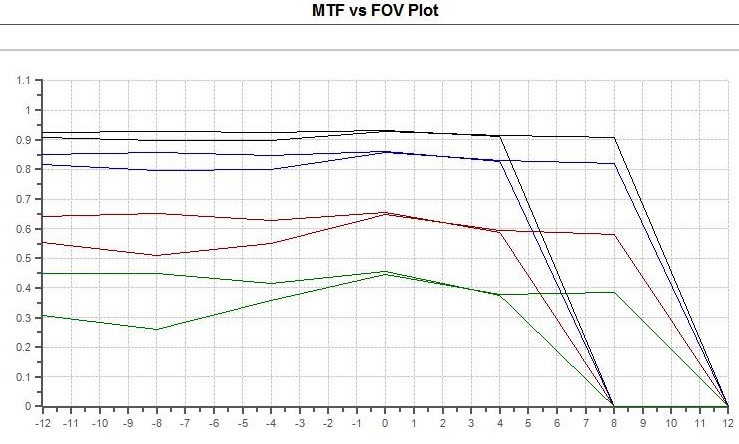 Wells Optical Bench printout of MTF by field of view and frequency. The horizontal axis shows degrees off-center, with “0” the center of the lens. The vertical axis is the MTF reading (“1” being theoretical perfection and “0” being gray mush). The charted colors show various frequencies. 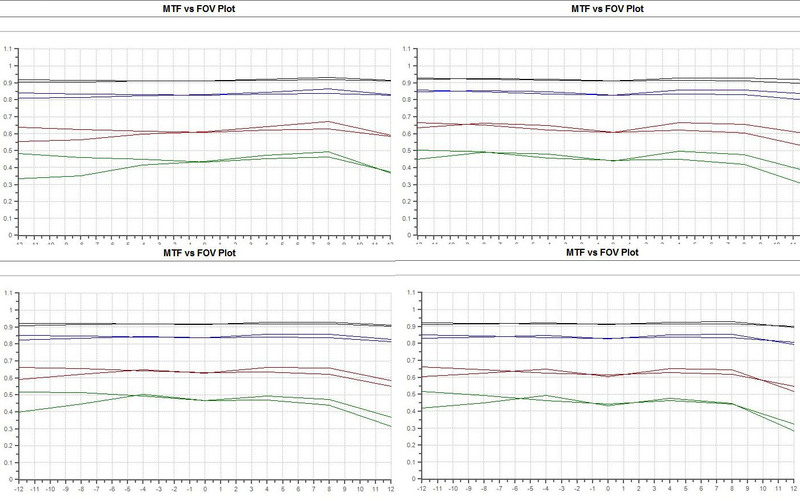 For this graph we chose to show the MTF at 10, 20, 50, and 80 line pairs per mm. 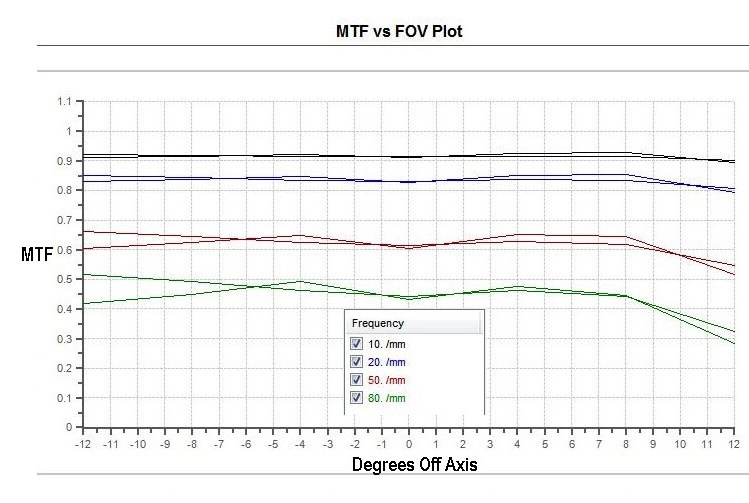 Most manufacturers’ MTF graphs limit themselves to 10 and 30 or 10, 20, and 40 as frequencies. We’re including some higher frequencies just because we’re still learning about using this tool to identify bad lenses. The graph above is of a good copy of a good lens, the Zeiss 35mm f/2.0. There are some slight differences away from center with one side having a bit more astigmatism and the other a bit lower MTF at higher frequencies, but this is really minor stuff that wouldn’t show up in photograph. To give you a bit more experience with this kind of graph, below are printouts from 4 other Zeiss 35mm f/2.0 lenses – all of which are optically excellent as determined by Imatest and careful pixel-peeping. Again, let me emphasize that what you’re seeing is normal (actually less than normal) copy-to-copy variation in good copies of the lens. Actual bench testing is almost like fingerprinting. No two copies are exactly the same. Notice the similarities. There is nearly no astigmatism right at the center and similar MTF values, particularly at the 10 and 20 /mm frequencies that are most critical. To give you some idea of what a not-so-good lens looks like on the same set of parameters, here’s one that’s not so good. Notice this one is still quite good in the center, but has some major problems developing on the right side. The settings on the optical bench we used for this series make it look much worse than it really is. While the graph makes it look like the MTF drops to zero, that’s simply because the settings we’re using report zero if focusing distance changes greatly or vignetting become severe. That makes a nice warning signal for ‘some human needs to come check this lens’. Our parameters are pretty tight: the awful looking graph above actually is a lens that looks a little softer on the right side, but certainly not horrible. An online sized jpg would look perfectly fine, at 50% pixel-peeping or in a large print you’d notice it. I’ll go into more detail about what we can do with the optical bench in some later posts; I just wanted to give you a quick overview for now. One thing you probably haven’t thought about is that lenses have to be mounted on the bench in order to do these tests. That requires a separate, fairly expensive mount for each brand of lens. Obviously we had to pony up to get mounts for Canon, Nikon, NEX, and Micro 4/3 lenses. But, since I was already pretty unpopular in the accounting department, I hoped to avoid spending a few thousand more dollars to buy Leica, PL, and other mounts for lenses that we have a lower number of copies of. I knew adapters might cause a problem, but thought, since we carry so many copies of various high-quality adapters, I could certainly find a few that were accurate enough to use. Once again, Roger’s assumptions were way off base. I won’t bore you with dozens and dozens of test results. But I’ll show you a good example. In this case, we took the lens in the upper right of the 4 examples at the top of the page and tested it on a number of Nikon to NEX adapters. Here are 6 examples. I’ll point out that we carry only name-brand, fairly expensive adapters, not eBay $29 adapters. All of them are tested frequently and used frequently and none of the ones I tested today had any problems. Still, not one of them would be acceptable for testing, so I guess I’m going to have to order those expensive lens mounts after all. Like a lot of laboratory testing, probably not a lot. Adapters couldn’t all stink or people wouldn’t use them. Like a lot of tests, you can detect a very real difference in the lab that doesn’t make much difference at all in the real world. Even photographers who use adapters are often adapting a larger format lens to a smaller format camera (Leica full-frame lens to Micro 4/3 or APS-C camera, for example). Assuming the lens is higher quality than a native lens they would otherwise be shooting, they might be perfectly happy. Still, I should point out that I only tested these 35mm lenses out to +/- 12 degrees (their field of view is actually +/- 30 degrees). Even on a Micro 4/3 camera, the lens would have a field of view of +/- 15 degrees what we see here at 12 degrees should be noticeable. In the examples above, though, center resolution is pretty much unchanged, it’s only when you get away from center that you start to see issues. So someone shooting portraits and centered subjects is unlikely to notice an issue. A landscape photographer, though, would likely see some problems along the edges of the image. Putting a great lens on your camera via an adapter might still be better than an average native-mount lens. On the other hand, that great lens certainly wouldn’t be as good as it would be on its native-mount camera. Do you test tele-converters? With the lenses? Do they exhibit the same problems? Roger, did you do the tests with the aperture wide open? What really happens is that the angle of the plane of focus changes slightly, right? Doesn’t that just mean that other things will be in perfect focus? That is unlikely to be noticeable in a typical landscape photo, especially one shot at f5.6 or f8, even when pixel peeping at 100%, don’t you think? thanks for the informative sharing! Always enjoy your blog posts. If you measure your adapters with calipers, you may find shockingly poor manufacturing tolerances. My Fotodiox Pro one was 8 thousandths of an inch off from one side to another. that’s a little different as you are basically just replacing the bayonet ring. as long as the ring is machined well it shouldn’t give you any real problems. I would like to find some olympus lenses to convert this way. I know this is a rather old topic and my question is a bit off the mark, but has anyone done testing of the adapters which have glass in them. I see many comments that a given adapter intended to adapt the Canon FD lenses to the Canon EOS (EF) mount degrade the image, but I am looking for a way to quantify it on even one example adapter from any manufacturer. Any one out there with a test bench willing to do a review of adapters with glass to show how badly they degrade an image? Has it been done and my google search has simply failed to serve up the proper URL? You do realize that your reviews are some of the best on the internet? Seriously, this stuff needs it’s own dedicated website. You could create a cult following with this stuff. maybe even a little $$$. With that out of the way, I like adapters. For hobbiest type work I say who cares? I mean, grab a few Minolta MD lenses, a cheap 20 buck adapter and go to town with an A7. I’ll take the downsides over buying those overpriced Zeiss lenses anyday. For paid work, you still get what you paid for. Stick to native mount and get the best glass you can afford. This article is well-meaning, but it’s in fact doing a lot of damage. You have to read deep down into the comments before you realize that your results have pretty much no bearing on real-world photography: it’s about lens testing. I’ve seen all sorts of comments linking back to this page, as “proof” that adapted lenses are a bad idea on Micro Four Thirds. My real world results? The Nikon 50mm 1.8G and 28mm/2.8 AIS are as sharp on my E-M1 as the Olympus 45/1.8 and 25/1.8, and in fact sharper unless I focus the native lenses manually. This is using a Metabones dumb adapter (as opposed to their Speedbooster). I’ve had equally good results — astonishing, in fact — with longer focal lengths: the Nikon 105/2.5 AIS, the 85mm/1.8G, and the Tamron 90mm Macro (non-VC). Admittedly, these are all legendary lenses, but that’s the point: they retain this standard of image quality if you use the best adapter. These lenses are giving me better results than I achieved with the same glass on a Nikon D700 and D7100 — even in the center, so it’s not simply because of the reduced image circle. You might want to do another test, comparing actual photos. The only test of that sort that I’ve seen is Ming Thein’s test of various macros, in which he admits to using a cheap adapter. Why does this matter? Because the MFT standard is a real breakthrough, and people won’t realize that if they believe that discerning photographers are restricted to native lenses. One of the major reasons that it’s such an important format is this: it brings all sorts of legacy glass back to life. According to Steve Huff he gets better results using his Leica lenses on the A7r, than on his M 240, which is real praise for the adaptor indeed! From his pupblished pictures one tend to agree! Before reading this, I was puzzled by the poor edge results I got shooting landscapes with a Techart Canon EF-to-Sony E adapter on one lens (EF 17-40mm f/4.0), vs good results with an EF 70-200mm f/4.0 IS shooting close to the 200mm end. After reading the article I did some re-shooting with the 17-40 and got slightly better results by focusing more carefully. (The Techart adapter provides for autofocus, but it hunts and is imprecise.) Conclusion from a limited sample: you’re certainly right that the problem exists (no surprise), and that it will be more visible to landscape photographers. Furthermore we should consider that, for commercially available top quality adapters, the misalignment induced by adapter is within the same order of magnitude of tipical flange to sensor position error. In other words, once the top-performing sample from the ones bench-measured above is mounted on a camera, an error is introduced which is generally bigger than the one induced by the eventual top-quality adapter. Bench testing lenses takes camera-side errors out of the equation, thus is useful to assess bad samples. But real word use implies coping with camera flange-sensor errors, and adapters are probably a marginal factor in the convolved; sometimes they are also effective in mitigating small flange misalignment. Tim, the problem is it’s different for every copy of every adapter we’ve tested. Not to mention a given adapter acts differently with different cameras and different lenses. So we’d have to test the camera-adapter-lens setup together. Change one and we change the total. I think what people are missing out on here is that the depth of field where this maximum sharpness exists is absolutely tiny. However the lens isn’t now soft all of a sudden, it’s just that the plane of focus isn’t parallel to the sensor. In actual fact you might find that the plane of focus is only a cm away at the edge than at the centre and so for all uses apart from art reproduction (and possibly front on architecture shots etc) the ‘margin for error’ in terms of the plane of focus is within bounds of the subject matter most people shoot. The biggest danger is at infinity focus but being as most infinity including shots are taken with a smaller aperture perhaps the situation isn’t as bad as we might fear. It would be good to know what ’tilt’ the lens mount has so we can quanitfy these things. Would it be possible to measure just how far the focal plane is misplaced at the edge of the frame? If we have that and the distance to the test chart we can work out the tilt of the lens mount and hence what effect this would have on various scenarios (including infinity focus). I’d happily do the math to work this out.. I am using my OM lenses (24/2.8, 50/1.4, 135/2.8) on my 6D. The colours always seem more punchy than my Canon lenses, but I have yet to own an L. I’m sure the tolerance issues here will apply, but not to the degree that I have noticed them. I’m using a Fotodiox Pro, but don’t know if cheaper adapters would do just as well. > Sem, the test we run goes through the full focus possibilities of the lens automatically. Focus is not an issue. I’m not perfectly clear on how optical bench works, but you write it tests at inf. I mean, if the adapter is slightly too long, no focus adjustment can make the infinity sharp, although closer objects can. And regarding TS lenses, I guess micron-grade central positioning would be difficult to ensure repeatably too?